Did anyone else grow up watching this guy? Call me cheesy, but I have fond memories of those times. I was always fascinated with the way Bob Ross would turn something that looked like it was going to be a disaster into something amazing. It was magic to me. And the image of that fro will never be forgotten! Please enjoy a little video tribute to that happy man. And yes .......it is a good day when you paint. Haha, I loved it! Thanks for sharing! 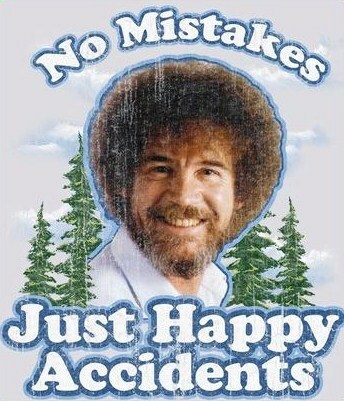 I love Bob Ross! He was the lead in before Sesame Street when I was a kid. I always watched him and then got my Big Bird on! I was always amazed when I was little how much he got done in such a short time, he made it look so easy! Wow I didn't know he was that popular! I was thinking I was kind of nerdy for watching him, but I guess he was loved by many. Thanks for the comments! I have a friend that used to watch him all the time. I would watch with her. I never thought I could do that stuff, but it just amazed me what he could do! Makes me want to get out my paints or pastels and do something. That's what I love about the guy. He was inspiring! That's awesome! We'll be cheesy together! I remember him well although I didn't watch him much. And it's so true - Every day is a good day when you paint. Thanks for the video. I used to watch him and think that his art all looked the same. He had such an easy going and kind manner that I always stopped flipping through the channels to watch him. Yes, I agree. He did have an easy manner. It was relaxing to me. Thanks for your comments! I love Bob Ross! I watch his old shows on PBS whenever I get a chance. :) I love watching how he creates his paintings; his show is what inspired me to start painting, and I find him so relaxing, too!